"Legends of Kalidasia is a space combat game which focuses on smooth game play without sacrificing tactics or detailed damaged modeling. Players control either the Surakari or Heragul Fleet and engage other players in chaotic space combat battles. Legends of Kalidasia has replaced the commonly found pseudo-Newtonian physics movement rules with a new system with emphasizes movement tactics while discouraging slow moving warship gun lines. Every warship in the game is equipped with an advanced sensor system. Players use these advanced sensor systems to choose which attacks are the most important to hit. The damage modeling system found in Legends of Kalidasia, while simple, still allows for individual warship systems to take damage." On their website you can also find the game FAQ and errata along with videos that cover topics related the game such as new products, tactics, battle reports, and terrain projects. A free introductory pack, Legends of Kalidasia: The Battle for Minex Six Intro Pack is available for you to try before you buy. 7/7/2012 - The Exterion Fleets supplement is now available for the Legends of Kalidasia as a printed product from the game's website or as a pdf download through Wargames Vault. "Since the earliest days of the Heragul Empire, the Exterion Fleets have explored beyond the boundaries of known space. It was the Exterion Fleets which first encountered the Krylan, the Thaylex, and likely the Surakari. However, an encounter with a Krylan-speaking alien race calling themselves 'The Colayth Guard' will prove to be the greatest diplomatic challenge to the Empire yet. 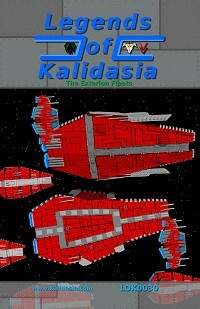 Legends of Kalidasia: The Exterion Fleets introduces the third combatant race into the Kalidasia universe. The Colayth Guard carry some of the heaviest firepower of the Kalidasia warships, but lack the advanced active armor system. For the first time ever, command a fighter carrier as the flagship of your fleet. Unleash new warships, new weapons, and unique special abilities as you defend your territory against Heragul aggression. This expansion requires Legends of Kalidasia: Rise of the Surakari, and the Admiral Rules Pack is recommended." 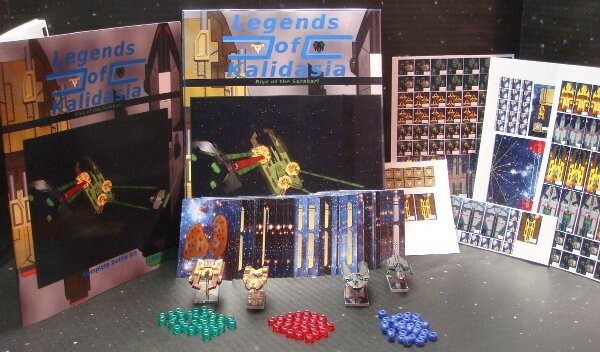 2/5/2012 - Legends of Kalidasia: Rise of the Surakari Battle Kit is now the base product with a pdf and 2011 Deluxe box version also available. An Admirals Rule Pack is now available and it expands on the base set with new warships, new weapons, a new scenario, and enhanced destruction rules. Alien Invaders and Defenders of the Empire Bundles are available and include the Battle Kit, Admirals Rule Pack, plus miniatures and fleet pack for that side of the battle. Pre-painted Surakari fleets and battle damaged Battle Cruisers are now available. The have also made the 3D files for the miniatures available at a name your price level to download and play around with. 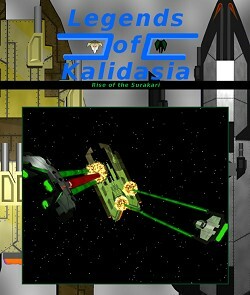 2/6/2011 - Now available is Legends of Kalidasia from Kalidasia Media Productions. From their website you can download a introductory kit which is a 17 page pdf download. You could then purchase the Complete Battle Kit which includes rules, counters, cards and everything you need to play in either printed or PDF form. The 2011 Deluxe Box Set contains everything in the Complete Battle Kit plus more scenarios, plastic tokens and 4 pewter miniatures. 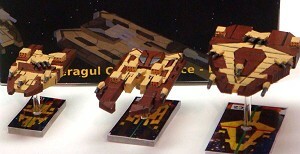 3 ship miniatures are available for each of the Heragul and Surakari fleets and are available in boxed sets or singly. Fleet packs are available for both fleets and they include additional printed stat cards and tokens plus a new class of warship as well as a new upgrade/crew card.